U.S. Secretary of State Rex Tillerson and Canadian Foreign Minister Chrystia Freeland face reporters before their meeting at the State Department in Washington D.C. on Oct. 11, 2017. WASHINGTON — U.S. Secretary of State Rex Tillerson will meet Canadian cabinet members during a visit to Ottawa next week where he will discuss a variety of international issues including the North Korea nuclear crisis. Tillerson's schedule includes a session with the ministerial committee on Canada-U.S. relations, in addition to meeting with his Canadian counterpart, Foreign Affairs Minister Chrystia Freeland, during his visit Tuesday. U.S. Secretary of State Rex Tillerson looks on as Canadian Foreign Minister Chrystia Freeland speaks at the State Department in Washington, U.S., Aug. 16, 2017. The two are co-hosting an international conference in the new year on the North Korea standoff. Tillerson has been seeking non-military solutions to the impasse, while other members of the administration, including President Donald Trump, have expressed skepticism about whether diplomacy can work. The secretary of state told the United Nations on Friday that China and Russia need to exert more pressure on their sometimes-ally — China by stopping the flow of crude oil to North Korean refineries, and Russia by ending the employment of North Korean migrants in that country, under "slave-like conditions,'' with wages sent back home to fund the nuclear weapons program. "We do not seek, nor do we want, war with North Korea,'' Tillerson said. He said the U.S. will not accept, as a precondition of talks, ending existing sanctions. His visit to Ottawa comes amid a series of lower-stakes tensions with Canada over trade: disputes over softwood lumber and aerospace duties are winding their way through various legal complaints, and the countries are preparing for an intense series of NAFTA talks in the new year. 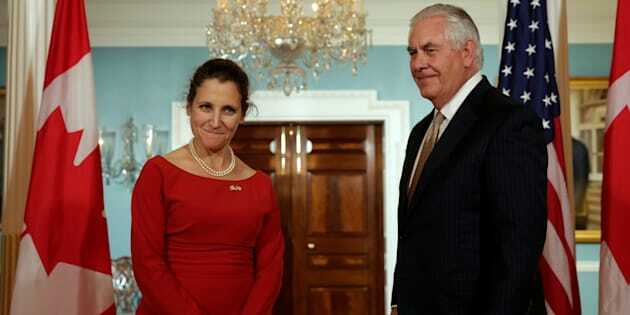 "I look forward to welcoming Secretary Tillerson to Ottawa next week for his first official visit to Canada as secretary of state,'' Freeland said in a statement.